Gary Goldberg studied painting and drawing at The George Washington University with Arthur Hall Smith, William Woodward, and Frank Wright. While in school, he studied en plein aire painting with the university’s prestigious summer program in Brittany, France. After 12-hour days of capturing the bright noon light and misty evenings of the Breton coast, the artist returned to Washington to set up his first studio. After graduating in 1979 with a B.A. in fine arts, he apprenticed with muralist William Woodward. He later taught painting in Arlington, Va. and served as artist-in-residence for the National Parks Service. In 1984, he formed a painting company to produce decorative art and murals. He is a cofounder of 411 Art Associates, a not-for-profit art studio cooperative in Washington, D.C. that provides low cost studio space for area. 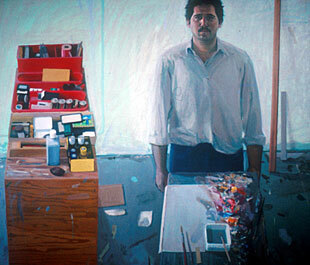 Gary Goldberg has exhibited his paintings in major solo and group shows, winning numerous awards and prestigious commissions. The artist is part of the “painterly realist” school that began its ascendancy in the early 1970s as a counterpoint to the abstract movement in America. He is committed to a style of painting with an aggressive surface and subject matter that is based upon direct observation. In his last two solo exhibitions, he explored the subject of darkened workplace interiors. Partly invented, partly observed, these paintings have a constructed quality with spatial distortions that move them away from pure observation. This tension between observed detail and distorted space results in work that is, uniquely, both visually energetic and quietly attentive. 1999 Artists’ Museum, Washington, D.C.
1996 Artists’ Museum, Washington, D.C.
1994 Franz Bader Gallery, Washington, D.C.
1991 Franz Bader Gallery, Washington, D.C.
1987 Franz Bader Gallery, Washington, D.C.
1984 Hull Gallery, Washington, D.C.
1981 Georgetown Art Gallery, Washington, D.C.
2002 Marin-Price Gallery, Chevy Chase, Md. 2001 Artists Museum, Washington, D.C.
2000 Allied Artists of America Annual Exhibition, New York, NY. 1998 Artists’ Museum, Washington, D.C.
1996 Artists' Museum, Washington, D.C.
1994 411 Art Associates, Washington, D.C., The Saudi Murals. 1989 Franz Bader Gallery, Washington, D.C.
1986 Georgetown University Gallery, Washington, D.C.
1983 The Tomlinson Collection, Washington, D.C.
1983 Zenith Gallery, Washington, D.C.
1982 Charles County College, La Plata, Md. 1982 The Dimock Gallery, George Washington University, Washington, D.C.
1981 Montgomery County Art Association, Bethesda, Md. 1980 Georgetown Art Gallery, Washington, D.C.
1980 Arlington Arts Center, Arlington, Va.
1979 Dimock Gallery, George Washington University, Washington, D.C.
Easton, Nina, “The Big Picture,” The Los Angeles Times, Feb. 28, 2002. Welzenbach, Michael, “The Enduring Vitality of the Still life,” The Washington Post, December 16, 1989. Lewis, Jo Ann, “Fletcher and Goldberg at Hull,” The Washington Post, November 23, 1984. Lewis, Jo Ann, “The Tomlinson Collection,” The Washington Post, May 5, 1983. Thomas, Sarah, The Washington Post, July 3, 1980. Thorson, Alice, “Three at Bader Exude Eclectic Spirit,” The Washington Times, December 14, 1989. Dunn, Warren, “Shelter ‘85,” Mortgage Banking Magazine, October, 1985. 1997 Price Faisal Palace Complex, Riyadh. Formal dining room mural, based on Pompeian frescoes, 26 by 8 feet. Four original murals, the largest consisting of series of 75-foot panels. 1993 Morton Bender Residence (former Korean Embassy), Washington, D.C.
Two room-size murals, a sky ceiling, and numerous trompe l’oeil details. 1989 Miniature Painters, Sculptors, and Gravers Society, Washington, DC. 56th International Exhibition, Awarded Best in Show. Two-panel mural depicting the college’s founding era of the 1880s, American primitive style, 14 by 5 feet. 1986 Axis Salon, Dupont Circle, Washington, D.C.
Foyer sky ceiling mural based on a 15th century Italian fresco, 18 by 35 feet. 1985 “Shelter 85,” Mortgage Banking Magazine Art Awards. Juror: Alan Feltus. Best in Show Award. 1981 Marriott at Key Bridge, Arlington, Va.
Apprenticed with William Woodward on an interior mural, pastoral themes, 80 by 6 feet.